Original German made GT1 scanner (Retail Price: $2,000). BMW GT1(Group Tester One)can completely cover ALL BMW systems,GT1 can do Electronic Control Unit (ECU) diagnosis and programming of ALL BMW series. Many of the original electronic systems on modern vehicles can now be reprogrammed using software; historically any changes to rectify software problems would involve a new ECU which would be purchased from the parts department and that is the only way that the independent market today is able to overcome these problems. The BMW GT1 system allows you reprogram all BMW car ECU?s to fix software or to install a blank ECU to a repaired vehicle. GT1 is the only system that allows you to do this and is absolutely essential if working on Freelander,GT1 is also the only scan tool that provides all diagnosis and programming for the very latest BMW vehicles this year. BMW GT1 software comprises of five systems: DIS(Diagnosis Information System), TIS system,diagnosis system, measuring system and manangement system. 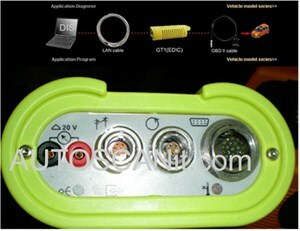 You can do diagnosis, programming and check the auto data information all in GT1. TIS AND DIS supply ALL the system diagrams of ALL the BMW car maintainence methods and coding information etc.